Pala International’s Bill Larson attends this event every year, held in the midst of the Alsace wine region of northeastern France. See Bill’s report from the 2008 show to get a taste. Fluorite specimens from Asia and Africa caught the eye last year, but it is the local variety that will take center stage this year, in l’Espace Prestige, housed in Sainte-Marie-aux-Mines’ local theatre. Bill looks forward to seeing you there. Well, Bay Area folk will have to keep their heads screwed on tight next month when the scepter—dubbed “Mongo,” after the hulking dull-bulb of Mel Brooks’s satirical Western, Blazing Saddles—makes an appearance at the first annual San Francisco Fine Mineral Show. The, er, “specimen” (does sound a little wimpy in this context) was unearthed two weeks ago by Joe George and Eric Spencer at Foster Hallman’s claim on the Nevada side of Petersen Mountain, which straddles the California–Nevada border, twenty miles northwest of Reno. Collectors refer to the locality as Hallelujah Junction (itself in California), which is a nearby convenience store. We’d bet that someone must have been cheering two weeks ago. The piece is almost two feet long and, according to Geffner, is perfectly proportioned. As can be seen by the photograph below, the crystal faces are topped by terminations that give the piece a sense of the architectural; say, a villa above sheer cliffs. 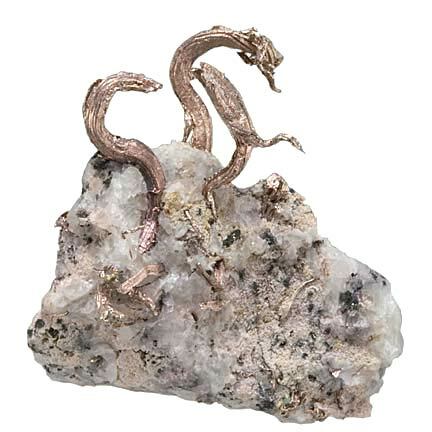 While Pala International is in the process of acquiring this specimen, it will be displayed along with many other fine pieces from Cascade Scepters at the San Francisco show, July 10–12. Pala’s Bill Larson will be attending and hopes to see you there. The Merelani deposit in Tanzania has consistently produced a wide variety of gem crystals since its initial discovery in 1966. 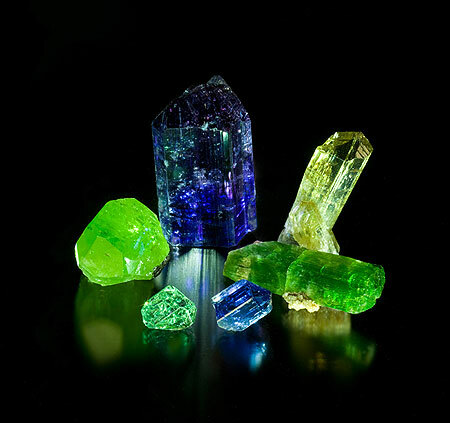 Along with the huge success of tanzanite in the gemstone industry, Merelani has opened up a spectacular array of intense gem crystals: lime green diopside, evergreen tremolite, mint green grossular garnet, and yellow to green zoisite crystals. 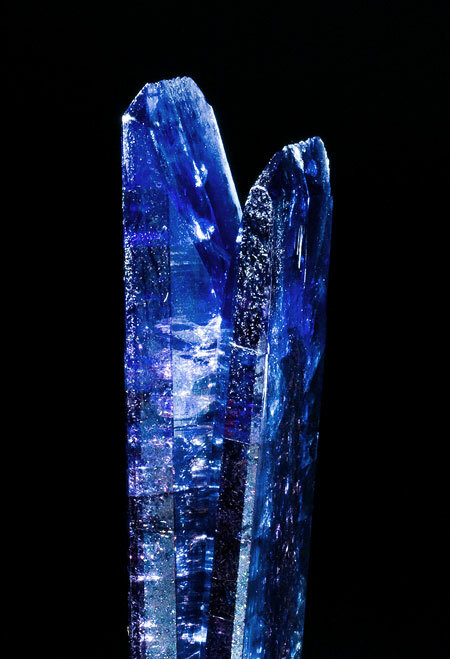 As the love of tanzanite crystals has grown amongst individuals in the mineral community, their hands of desire have stretched by way of the mineral dealers, and have fostered in some miners an appreciation for pristine crystals that must be extracted with care. 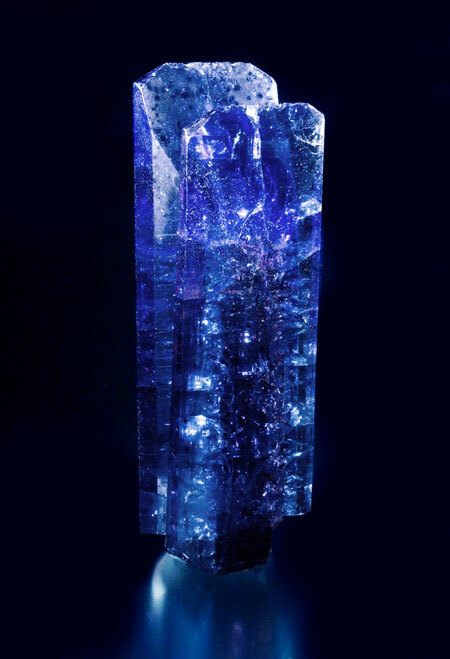 As higher prices have been paid for tanzanite, this crystal preservation mentality has spawned a steady stream of tanzanite crystals reaching the marketplace for all levels of collectors to enjoy. Fortunately for the connoisseur, out of this production we do see the occasional rare formation or matrix piece. 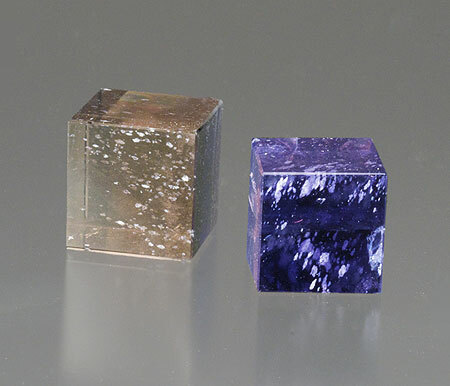 This month we show off a striking tanzanite crystal that seems to be in a contact twinned pattern. 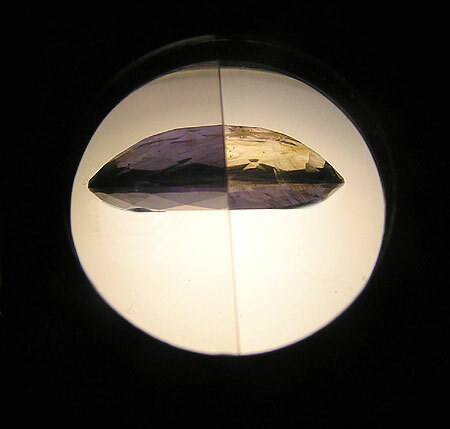 The inclusions create a starburst pattern with transmitted light, with a purple banded core and a blue perimeter. This delicate piece didn’t make it out unscathed, however; there is some minor damage and an excellent, clean repair. 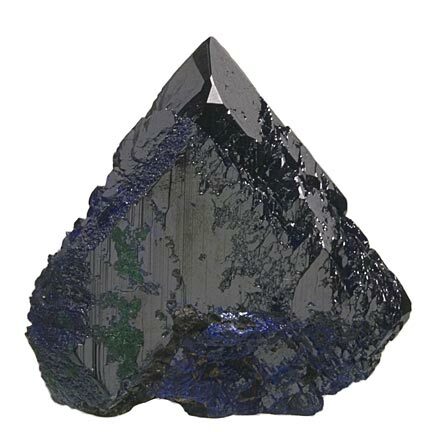 The second tanzanite crystal surfaced with some matrix still attached, which is extremely rare because of the weak contact between the brittle graphite conglomerate and the glassy tanzanite surface. An exceptional miniature for those who collect matrix specimens. Under the co-direction of Bill Larson—himself a protégé of famed San Diego county mineral collector and curator Josie Scripps—Pala began life as Pala Properties International (PPI) in 1969. The venture was a partnership between Larson and fellow Californian Ed Swoboda, a collector who had been mining in Mexico, Africa, Asia, Australia, and South America. Swoboda brought the Stewart Lithia Mine to the table; Larson’s father, Carl W. Larson, knew Monte Moore, who owned three other patented mines in the famous Pala district: the Pala Chief, the Oceanview, and the Tourmaline Queen. Pala leased those, purchasing them in the mid-1970s. 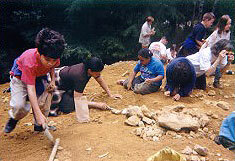 Mine activity in the Pala district dates back to the 19th century, when gem house buyers from America, Europe, and Asia were quite interested in what the region produced. 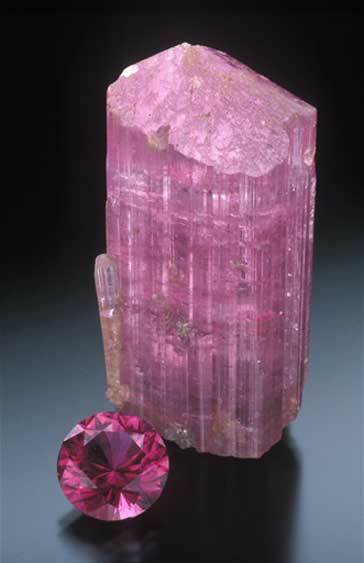 Key to demand in China was the Empress Dowager’s turn-of-the-century passion for pink tourmaline, as Larson told a Chinese audience in 2006 (see presentation here). The district has had a series of revitalizations over the years. 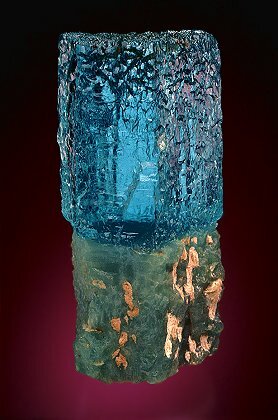 In 1972, building upon the success of the Stewart, Pala turned to the Tourmaline Queen, which produced what it has become famous for: an unequaled group of about fifteen world-class tourmaline specimens that feature distinctive glassy “blue cap” terminations, the quintessential example from this amazing find being the “Candelabra” (photographed by Dane A. Penland). 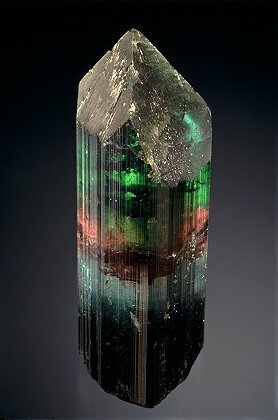 The late Vince Manson, then curator of the American Museum of Natural History, called the large pocket of tourmaline “the find of the century” in terms of color and perfection. The great man at Tiffany was Harry Platt. He kept me waiting three hours in this tiny nook with a hard wooden chair. He didn’t know me at all, but fortunately I had a recommendation from Paul Desautels [then curator at the] Smithsonian. When Platt let me in and we talked and he saw that I had fine tsavorite—a gemstone that he had named—he was enthralled. And that started a friendship between Pala International and Tiffany & Co. that continues to this day. Desautels was crucial in Larson’s development regarding minerals, as well. Larson went on to give lectures in the 1980s to the entire gem staff at Tiffany. And he began a strong personal friendship with Peter Schneirla, who was Tiffany’s senior vice president of jewelry merchandising and manufacturing. After a six-year absence, Schneirla is again a senior VP at Tiffany and the two speak a few times a month. In 1973, Pala went to Mexico, with Swoboda supervising the mining of boleite and cumengeite at the Amelia Mine at Santa Rosalía (El Boleó) in Baja California Sur. In 1979, Swoboda sold his interest in PPI to Larson. The new company, Pala International, then sold the Pala district mines back to Swoboda before buying the Himalaya Mine, in Mesa Grande, which PPI had leased earlier and worked with members of the Amelia crew. The Himalaya Mine had been active during the Empress Dowager’s gem craze and in fact was years later leased and owned by Chinese gem buyer “Tom” Quin. In the early 1950s its new owner, Ralph Potter, found crystals in a new tunnel on the mine’s west side. Traveling across the country, he sold the mine’s output and built its reputation. It was a consortium formed by Potter that sold Larson the Himalaya. From 1981 when Pala constructed its new 750-foot tunnel, to mine’s closure in 1997, the company put in 13,000 feet of tunnel—mapped by Kennecott Mines. 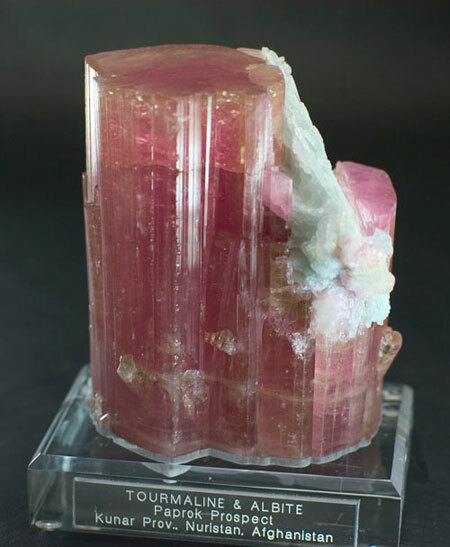 The mine produced two tons of tourmaline during Pala International’s operation. 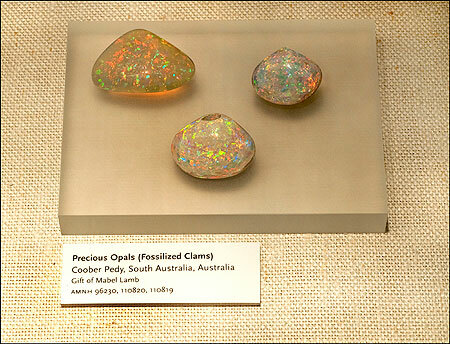 Other local Pala International mining ventures included two Hiriart Mountain (Pala district) mines: the Sempe, which produced morganite specimens and ceased operations in 1978, and the San Pedro, which produced a fine aquamarine specimen now housed at the San Diego Natural History Museum. In the early 1980s, Pala International entered into a sapphire dredging project in Sri Lanka—the country’s first legal foreign joint venture. (The Tamil separatist insurgency, however, nipped this promising venture in the bud…) Since that time, Pala International has consulted on mineral specimen and gem mining projects in Kenya, China, Russia, and Burma. 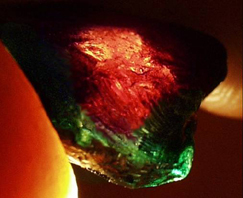 One of the more recent mining ventures (2005–06) involved iridescent andradite (garnet) in Alamos, Sonora, Mexico. 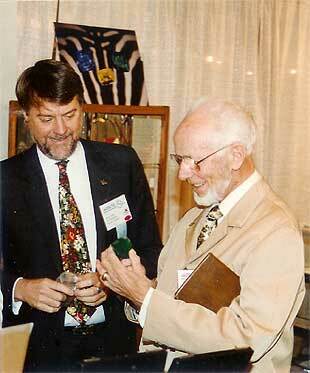 Bill Larson was integral in the formation of the American Gemstone Trade Association in 1981 and served on its board for six years. Three years later, Larson helped found the International Colored Gemstone Association and currently is ICA Ambassador to the United States. He is the only gemstone dealer to have been honored with a seat on the board of governors of the San Diego Museum of Natural History. Just as most of us consult our watches for the time, Larson must have to consult his for the time zone. Over the years he’s made 40+ trips to Africa, 35 to Sri Lanka, roughly 100 to Thailand, 33 to Burma, many to Russia and Vietnam, and perhaps 100 to Europe. Pala International has been a fixture at numerous trade shows and conferences, including the granddaddy of them all, Tucson, since 1969. 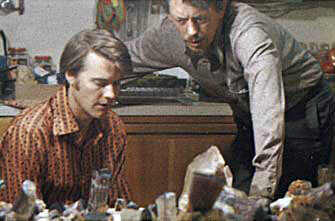 While building a personal mineral collection that is considered one of the finest ever assembled, Bill Larson also has built a wholesale business team that is virtually synonymous with the term “fine colored gemstones.” To support him, he’s had a dedicated group—retaining three members of Pala’s senior staff, in particular, for decades: John McLean (1971), Pala’s director of mining, who was instrumental in the locating and unearthing of the famous blue-cap find; Josh Hall (1976), who as VP of the enterprise oversees the day-to-day operation of everything from mailings to organizing trade shows, and also is a board member of The GemGuide (a quarterly wholesale pricing reference); and Gabrièl Mattice (1988), staff gemologist, who enjoys advising connoisseurs and tracking down those rarer, more difficult acquisitions. The company website, Palagems.com, will celebrate its own ten-year anniversary this coming February. Developed in 1999 by author and then-staffer Richard W. Hughes, the site is not only home to Pala’s online catalog, but is a storehouse of valuable reference information, historical reprints, and developing news. Mineral specimen aficionados in particular are familiar with The Collector, Pala’s retail affiliate, which opened in Fallbrook in 1971. In addition to fine jewelry, The Collector deals in world-class, and more affordable, mineral offerings. With the new addition of Will Larson, the coming months will see a move of the mineral sales to their own operation: Palaminerals.com. For more on Pala’s forty-year history, see the following. According to “The Fabled Viking Sunstone (also known as Viking Compass),” a navigational tool in the form of a stone is mentioned in ancient Viking sagas. These tales, which were written down in the late Middle Ages, recall (amongst other things) the adventures of explorers during what is now known as söguöld, or “period of legends”—roughly the 10th century. Voyages to the New World were recounted in the sagas as well, and were mistakenly thought to have been mere fables. Navigation by a stone likewise might have been dismissed but for the work of insightful scholars. The terms associated with these navigational aids—“compass” or “sunstone” [see note]—actually apply to a number of materials, both real and “theoretical,” that could have been used by Nordic navigators. The polarizing optical properties of these minerals are thought to have allowed pilots to see the “hidden sun” obscured by subarctic mists. Such a theory was, according to Skalwold, first proposed in 1969 by Thorklid Ramskou, the Danish archeologist who coined the term Vikingernes Kompas, as it relates to iolite (aka cordierite). At the time of Ramskou’s hypothesis, a modern version of an instrument utilizing polarizing optics was in fact in use—by Scandinavian Airlines pilots on trans-arctic flights. Other materials that could have been employed include calcite rhombs, which feature an optical doubling property. This theory is supported by the work of the late Viking navigator expert, Leif K. Karlsen, author of Secrets of the Viking Navigators. Read the full, fascinating story of medieval Nordic ingenuity here. Norwegian geologist Asbjørn Halvorsen discovered an unusual phenomenon in the early 1990s. Having collected samples of chromiferous green tourmaline in Nchongo area of northeast Tanzania’s Umba River valley, Halvorsen fully expected to see color-change. 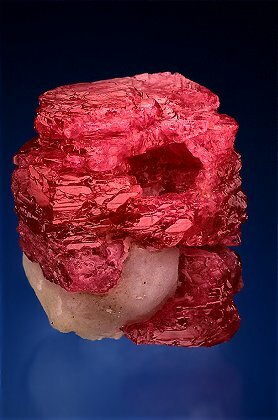 After all, the valley is famous for this phenomenon in garnet, tourmaline, and sapphire. In addition to typical color change, what Halvorsen saw in his new samples was altogether different. In transmitted light, if the sample reaches a particular thickness (always the same, even using stacked crystals), the transmitted light’s perceived color made a dramatic shift to red. 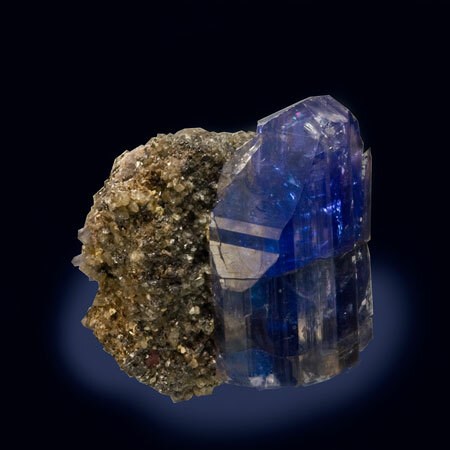 In a 1997 paper published in the British Journal of Gemmology, Halvorsen, along with Brenda Jensen of the Mineralogical Museum of Oslo, called this the “Usambara effect,” after the mountain range that is the source of the Umba River. 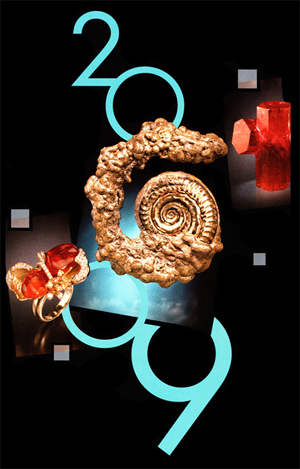 This led to ten years of study and two more papers in the Journal of Gemmology, the last a cover feature in 2006. Need an idea of what to get that picky patriarch for Father’s Day? 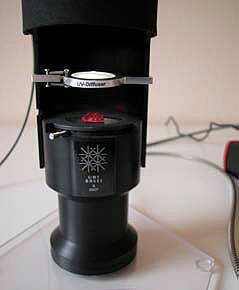 May we suggest the SSEF Swiss Gemmological Institute’s portable spectrometer? At 24,000–30,000 Swiss francs (plus VAT and shipping), you might want to pool with your siblings, but it’s a gift Dad will never forget. According to a presentation by SSEF’s Dr. Krzemnicki a year ago, the tool was developed with M. Steinacher, of the University of Basel’s Physics Department. Using a simultaneously, rather than sequentially, diffracted light source, it measures absorption, transmission, and even luminescence, which previously wasn’t available using older spectrometers. Since we’re celebrating Pala International’s 40th birthday this month, let’s take time to celebrate the re-issue, on DVD, of a five-year-old (as well as a couple more in the oven). 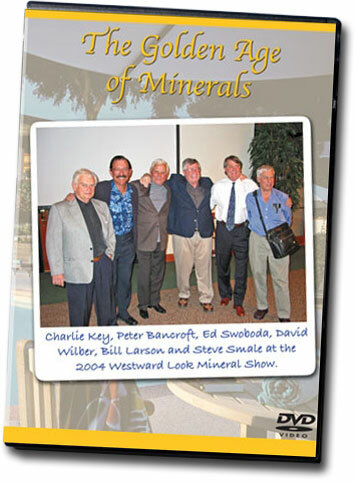 The Golden Age of Minerals, an event held at the 2004 Westward Look Mineral Show, brought together six iconic figures of the mineral collecting world: Charlie Key, Peter Bancroft, Ed Swoboda, David Wilber, Bill Larson and Steve Smale. This once-in-a-lifetime evening of storytelling and Q&A was captured by BlueCap Productions. It’s available now on DVD for the first time here. BlueCap, of course, doesn’t dwell on the past. In an effort to encourage the younger set, the New Crystal Hunters series will offer an installment to be shot in Arkansas in July. 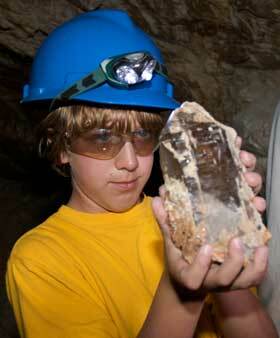 And, we’re told, the young folk also will be traveling this summer to the amazonite mines of Colorado. Several members of the Pala staff will attend this show. See you there! 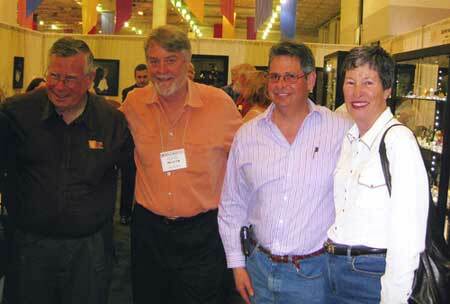 The Dallas Fine Mineral Show moves to Houston this year. Please note: We regret that Pala International will not exhibit at this year’s show. 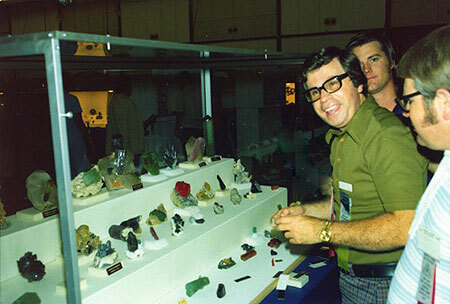 At the time of the show, Bill Larson will still be in the Far East traveling to obtain new gems and crystals. This year’s Tucson Gem and Mineral Show was hopping despite the economic woes. All the usual suspects were out for a fix: good stories, good laughs, and great rocks. The über-booth was the crossroads once again, with constant banter and laughter echoing from the area. There were even some some misguided champagne corks flying around that added to the distinguished crowd. 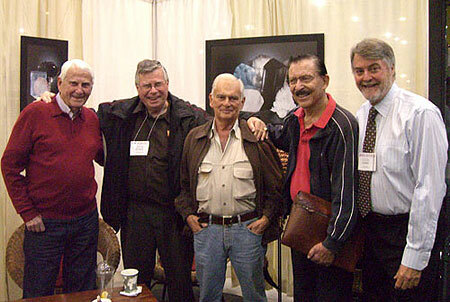 There were plenty of recognizable faces from miners, collectors, authors, researchers, and some newcomers. In February, New York’s Cornell University unveiled scores of mineral specimens and faceted gemstones from the collections of alumni, faculty, and friends. 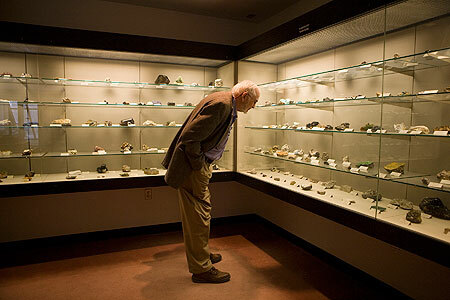 The collections are housed in the Timothy N. Heasley Mineralogy Museum, in Snee Hall, home to the Department of Geological Sciences. This month we though we’d whip out some big minerals for those who like some poundage for their buck. In this heavyweight mineral bout we feature a large, classic pink tourmaline from Afghanistan and a monster feldspar oddity from Madagascar. Pala’s Bill Larson acquired this historic piece, which dates back to the mid-20th century, at last year’s Munich show. In this corner, weighing in at 1.77 lbs., an outstanding orthoclase feldspar single crystal from Itrongahi (aka Itrongay), Madagascar. 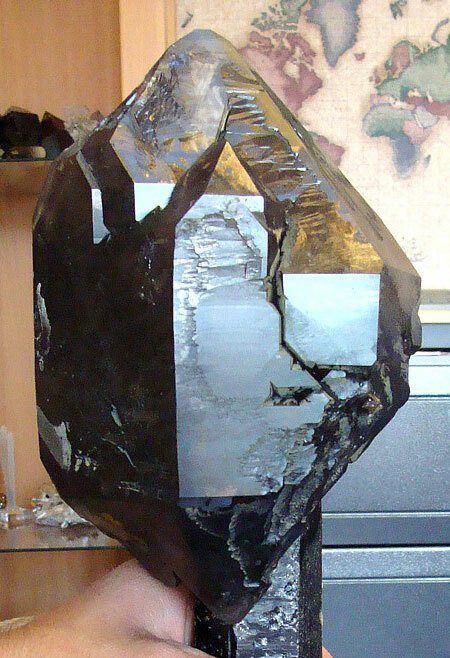 This is arguably the largest gem orthoclase crystal on the planet. 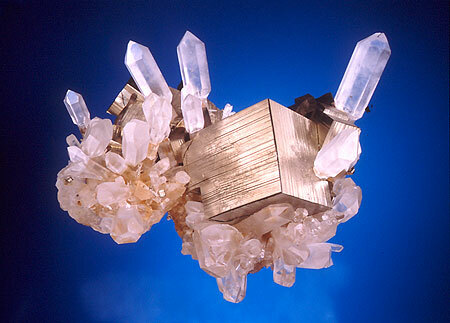 This behemoth not only exhibits some complete crystal faces, it also contains a large amount of gem-worthy portions. 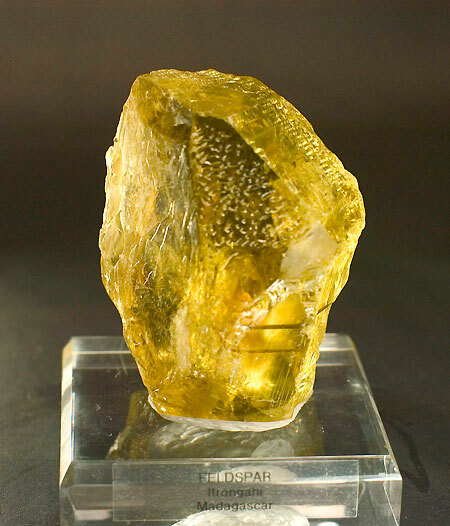 The intense, slightly greenish-yellow hue is very deceiving at first, as your first synapse calls out, “Heliodor.” But as the crystallography is illuminated, it’s clearly from the feldspar family. In this corner, weighing in at 2.82 lbs., our second feature is a massive pink tourmaline crystal with an albite plate splitting the main crystal from a smaller secondary termination. Here we have a classic pink tourmaline from the Paprok prospect of northeastern Afghanistan; a striated shaft with small tourmaline crystals popping out all around. The specimen is capped by a thin green layer and a flat termination. It features a beautiful assortment of light and dark pink hues mixed with the white albite and a few greenish zones. A unique scientific opportunity occurred as Puna Geothermal Venture workers were drilling into the volcanic crust on the eastern edge of the big Island of Hawaii. Boring down through the strata of solidified lava flows from the nearby Kilauea volcano, geologists punctured a shallow magma chamber. 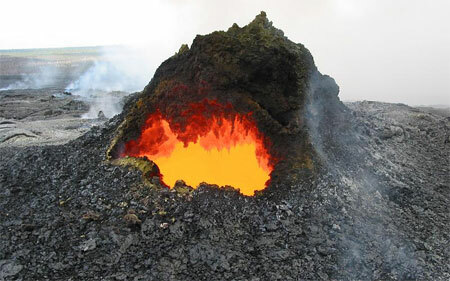 As the drill moved from hard rock to magma, the liquid shot up the bore-hole 5–10 meters before solidifying. The project was designed to find steam underground that would drive turbines on the surface to generate electricity. This chamber of liquid rock was encountered at a relatively low depth of only 2.5 km. This geothermal-anomaly surprised geologists: it’s unprecedented to find such a structure that maintains temperatures around 1050° C. Similar projects in Europe and Australia had drilled twice as far and encountered temperatures around only 260° C.
The chemistry of the magma is also unique, with 67% silica content, defining it as a dacite. 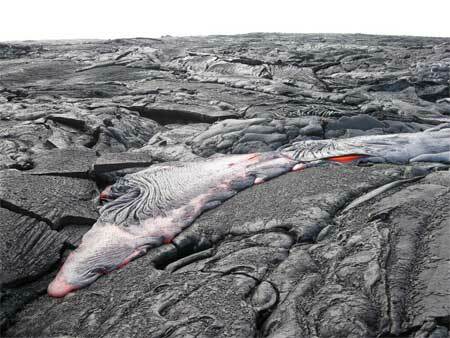 This means there is a mixture of basaltic (50% silica) and granitic (75% silica) type magmas. The Hawaiian islands are comprised mainly of basaltic rocks or oceanic-type crust and granitic rocks, which make up the majority of continental crusts. This means we are seeing the first continental/ granitic-type magmas being introduced into the conduit under the Hawaiian island-chain hot spot. 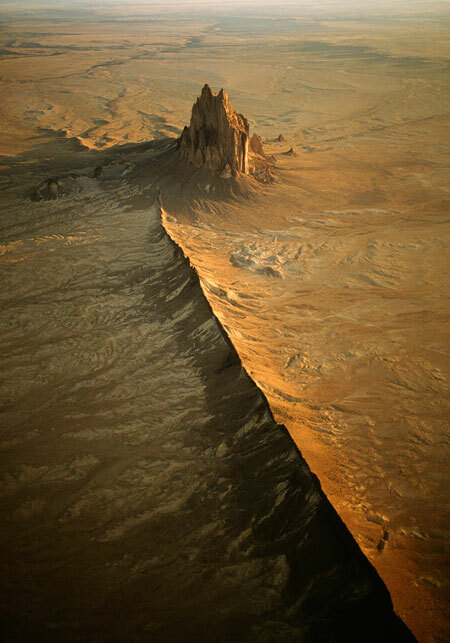 Michael Collier, with a 34-year career in aerial photography, is featured in an exhibition, “Stones from the Sky,” at the Denver Museum of Nature & Science through August 2. 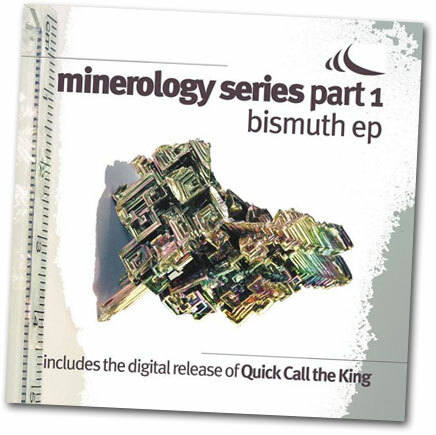 What they lack in spelling skills, the folks at the British Reverberations music collective make up for in reminding us of the beauty of bismuth. For those of you with your periodic table still committed to memory, the element bismuth is Bi at No. 83. 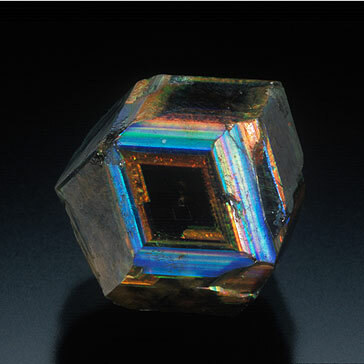 But if its physical appearance doesn’t come to mind easily, that’s because bismuth crystals aren’t normally found in nature. Hopper crystals, however, can be lovely, as evidenced by the cover photo of the “Bismuth EP,” (itself lifted from Wikipedia). 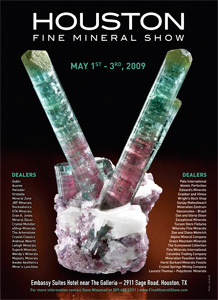 This presentation will make a great companion piece to Jason Stephenson’s “Collecting and Investing in World Class Gemstones” featured previously in Pala’s Gem News. The guide also includes maps, floor plans, traffic tips, a restaurant guide, and other show information. In the last issue of our Mineral News we mentioned a DVD that follows three young people exploring mines in the Pala district of Southern California. 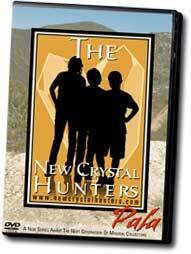 The DVD, the first in a series from BlueCap Productions called The New Crystal Hunters, will be released on February 12, 2009 at the 55th Annual Tucson Gem and Mineral Show. BlueCap Productions’ Bryan Swoboda told us that he’s begun a donation program with the intent of getting the DVD in the hands of as many kids as possible—free of charge. On display at the Tucson Gem and Mineral show, look for one of the major specimens collected by the youngsters: a smoky quartz crystals with phantom inclusion (pictured with Max, below). 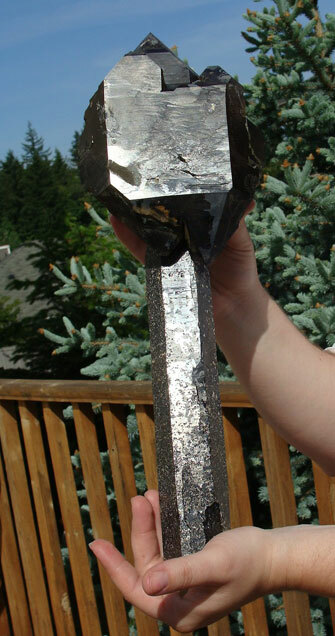 The crystal will be donated to the Fallbrook Gem and Mineral Society. BlueCap Productions is sharing display space this year with Pala International at the Main Show, Aisle 5 East. Is this odd to you? How odd does a mineral have to be to qualify as an oddity? 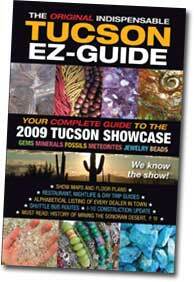 This year’s Tucson mineral show, with its theme “Mineral Oddities,” will be the pool to dive into and ponder the shtick surrounding the word as it relates to the mineral world, and engage the sticklers who indulge in the unusual. Minerals are the end-members—born out of a chaotic convergence of chemistry, heat, time, and pressure—representing the infinite possibilities of crystal formation. Every mineral specimen is unique and some leave a lasting, sometimes odd, impression. A recognizable form or personified rock can be a visual stimulant that skips the usual beat and requires a second look. An animal form, a miniature landscape, geometric shapes, and, of course, balls of all sizes and textures. We though we’d show you a few calcite balls of our own—from Romania: coconut twin spheres and some prickly conjoined ones. 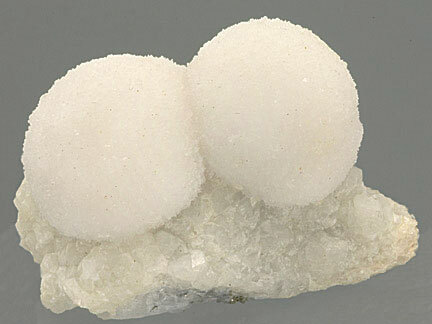 These oddball calcite orbs come to us from Romania. The first one is from the Boldut mine in Cavnic, Romania. 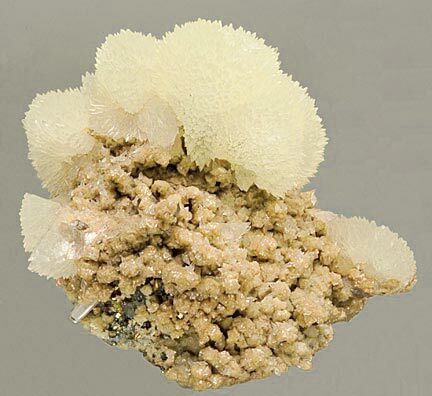 It’s an interesting assemblage of calcite clusters huddling together like a family of porcupines. The second specimen is from an undetermined locality in Romania and conjures up all sorts of strange associations. No, “Crystal Kid” is not a methamphetamine rehab program. It’s one of dozens of field trips offered by Bob Jackson’s Geology Adventures, based near Seattle–Tacoma, Washington. Following our mention in December of the New Crystal Hunters DVD, Jackson wrote to let us know about the mineralogical explorations he’s been leading for twenty-five years, now involving more than a thousand adventurers a year—both kids and adults. Jackson’s “adventures” run the gamut from day trips to camping trips to international excursions in Africa and Australia. Quartz scepters with pyrite, collected in 1978, now in the Bruce Oreck collection. This specimen, from the Spruce Ridge locality, King County, Washington, was featured in Bob Jackson’s display at Tucson 2008. 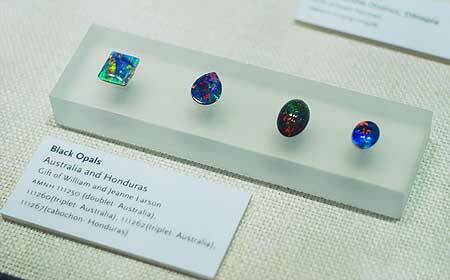 Photo: Jeff Scovil, from American Mineral Treasures.